With its vibrant blue head and wings and reddish orange neck and chest who wouldn’t want the beautiful Eastern Bluebird in their backyard? Not to mention the fact that this bird is great to have around for insect control. We have had them in our yard at our previous homes but it has been a challenge to get them where we live now. Our previous homes had woods nearby as well as an open field. Bluebirds prefer this type of habitat in addition to places such as around golf courses, pastures, and nature parks. If you are surrounded by houses like we are in a subdivision and do not have enough open space it may be more difficult to attract Bluebirds to your yard. However, you can still try as we do (we have seen them nearby) because you just never know. How Do You Attract Eastern Bluebirds? It is much to your advantage if you have the type of habitat that I have mentioned above. You may see them every once and a while flying in your yard but they just do not stick around. There are some things that you can do to keep them there. While they do not eat wild birdseed you can place dried meal worms out for them which you can purchase at most bird feed stores or they can be alive too. 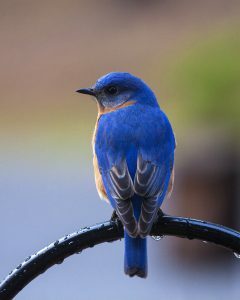 Bluebirds also eat insects such as caterpillars, beetles, crickets, grasshoppers, and spiders. Obviously meal worms are easier. Note: In winter Bluebirds will eat fruit such as blueberries, hackberries, dogwood berries, and honeysuckle. Bird baths are also important to have, not just for Bluebirds but for all birds so that they can drink from it and take baths to maintain their feathers. We had a whole entire family of Bluebirds in our birdbath (previous house) that we had placed outside on our deck railing. That was so much fun to watch! Another thing that you can do is to place a nesting box in your yard. Bluebirds like to nest in natural cavities and old woodpecker holes but also frequent Bluebird nesting boxes/houses. It is not just any bird box as it must have the correct specifications. You can either purchase one that is specially designed for Bluebirds or you can Make Your Own. The hole should be 1 1/2 inches and should be made out of wood, preferably cedar or plywood. Also, make sure that your Bluebird house does not face direct sunlight during the day and place it towards trees or shrubs so that they have a place to land. Place the house anywhere from three to six feet off of the ground on a pole, post or fence. Be sure to clean the nesting box out at the end of a breeding season and keep in mind that these birds will utilize the house during winter months if they stay year round where you live. More on that later. Added Note: Starlings and House Sparrows may also want to take up residence in your Bluebird box. If you see them taking nesting materials into the box you can just lift the lid and get rid of the materials if you do not want them moving in. 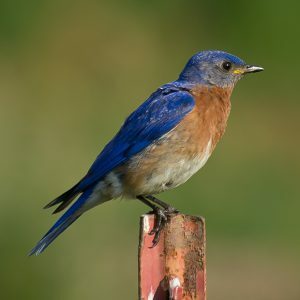 Where Are Eastern Bluebirds Located? 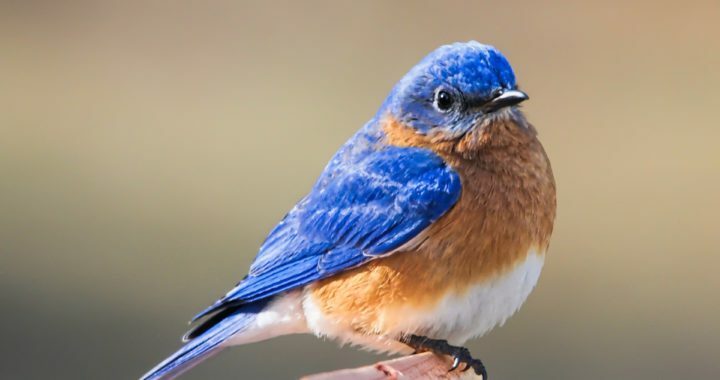 The Eastern Bluebird can be found east of the Rockies, southern Canada to the Gulf states, and southeastern Arizona to Nicaragua (as per Wikipedia). 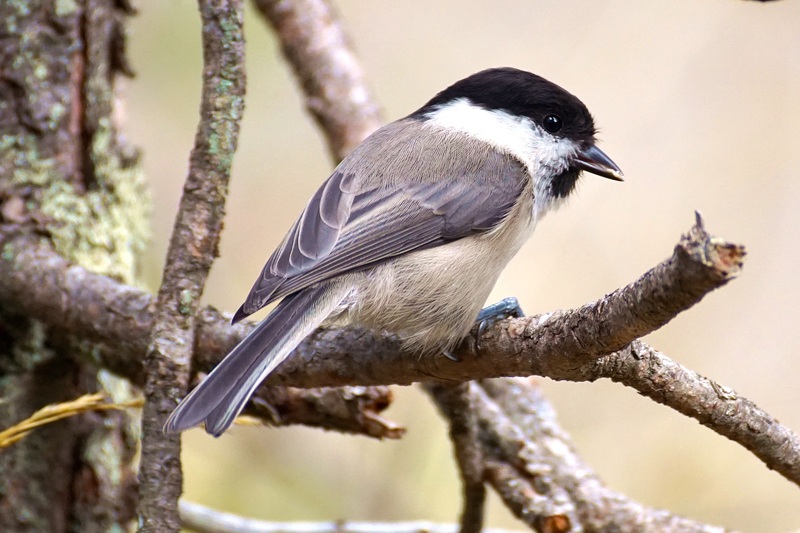 The more northern birds migrate to the southeastern United States or Mexico. Other more southern birds such as in Kentucky where I live are year round birds but may partially migrate (meaning a short distance such as the next state) if food is scarce. Nesting time starts as early as February through April for the first brood. Bluebirds may have two to three broods in a breeding season which lasts until about August. Once the male attracts a female it is the female who primarily builds the nest which can take anywhere from five days to two weeks. She may lay up to four or five eggs, and sometimes up to seven (one per day). It will take anywhere from twelve to fourteen days for the incubation. Once the birds have hatched it will be another fifteen days before the nestlings leave the nest. Both the adult male and female feed the nestlings until then. Then the fun begins for you when the nestlings start to fledge from the nest and you get to watch them learn to fly. Bluebirds are of the thrush family just like the American Robin. In the United States there are 3 species of Bluebirds…the Eastern, Western, and Mountain Bluebird. The eggs laid by the Eastern Bluebird are a powder blue and rarely white. 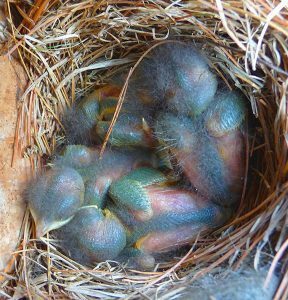 Bluebird nests can be made of pine needles, woven grass, straw, hair, and feathers. Bluebirds are 5.5 to 7 inches long. The female has blue wings, a gray crown and back, brown throat, chest and sides. The Eastern Bluebird is always a delight to have in your backyard. Not only is it a beautiful blue with its reddish orange breast but it is also great to have around as it likes to eat insects. You can attract Eastern Bluebirds by doing a couple of things. 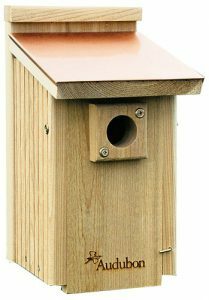 Place a Bluebird nesting box in your yard either on a post or on your fence about three to six feet off of the ground. These can either be purchased or you can build one if you are so inclined. Just remember that Starlings and House Sparrows might also want to take up residence in the nesting box. You can alleviate this by removing their nesting materials from the box. It is also good to have a birdbath for them. Not just for Bluebirds but for all of your feathered friends as they need water for drinking and bathing to maintain their feathers. Additionally, you can add either dried or live meal worms in your bird feeder too. Plus, since they eat fruit in the fall and winter months (if they stick around where you live) you can have fruit bearing trees such as dogwood, hackberry, and blueberry bushes. Check with your local gardener for other trees that may attract Bluebirds. Once you have attracted them in you can be sure that you will be entertained just watching these beauties as they fly around your yard and splash in your birdbath. Do you get Bluebirds in your backyard and have anything to add that may be helpful to attract them? Please feel free to make your comments below. I would love to hear from you! Posted in Backyard Birds, Landscaping For Birds, Songbirds, Wild Bird Food. Hi Donna I love the way your web page is set up! What kinds of birds are located in Southern Michigan and Northern Ohio? My Dad likes to bird watch and I would like to get some ideas of the birds in our area. He is also in the market for some good binoculars. Do you have any ideas? Ernest, thanks for your comment! You get a lot of the same birds that I do here in Kentucky such as the Eastern Bluebird, Eagles, and different species of hawks to name a few. In May, if you live any where near Port Clinton, Ohio there is a warbler festival where many warblers are migrating through. It is held at Maggie Marsh and definitely something to see if you can. The birds are all close up and personal and very beautiful. My husband and I go there every year. As for binoculars, it all depends on what kind of magnification you want and how much you want to spend. A good set will cost you $200 or more but you can purchase cheaper ones. However, once you have tried the good ones you don’t want anything less. We actually have an 8 x 42 set by Nikon, and 10 x 42 Zeiss Conquest. They were a little expensive ($900) but wow they really are an excellent set of binoculars. I enjoyed reading your article…probably because it’s Mid-March here in New England, we received over two feet of snow just two days ago and I now have Spring fever. We occasionally have a few bluebirds visiting our feeders during the summer. They particularly love suet with berries and we have several hanging in our crab apple tree. I’ll try adding dried meal worms to the black oil sunflower seeds in our feeder to see if we can attract more bluebirds. You are so lucky to get them Karen. The suet with berries should definitely work and believe it or not there is suet that you can purchase that has the dried meal worms in it. So you may want to check into that. Thanks for your comment! Hope the snow goes away quickly. I have never seen an Eastern Bluebird down here in Florida before. I know there is a big birding festival every January to showcase he migratory route of different species of birds at the Merrit Island National Wildlife Refuge. Do you know if Eastern Bluebirds follow the Atlantic Florida migratory route? Tony, thanks for your comment! I think we stopped at the refuge once a long time ago when our kids were very young. Something to check into for sure the next time that we go. Eastern Bluebirds are permanent residents in Florida and in many southern states. If they do migrate they do what is called a leapfrog migration meaning that they may jump states when food is more scarce or when the weather is extreme. So enjoy them if you get them in your yard. They are a beautiful bird!